The Orchid ImmunoStrip® is trusted and widely used by tissue culture labs, growers and hobbyists as a fast and reliable on-site diagnostic for CymMV and ORSV, the two most prominent viruses found in orchid plants. ImmunoStrips® require no tools or experience to run. 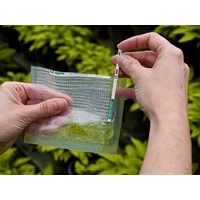 The test is perfect for testing incoming shipments of material, for periodic health checks in the greenhouse, or for testing single plants being brought into your prized collection. The Orchid ImmunoStrip® was recently optimized to give you faster results and a broader detection range. The Orchid ImmunoStrip® is now able to help diagnose a previously undetected Asian strain of CymMV, providing more accurate results than other tests on the market. The new test format also facilitates a faster reaction time, giving you results in as little as a 5 minutes.